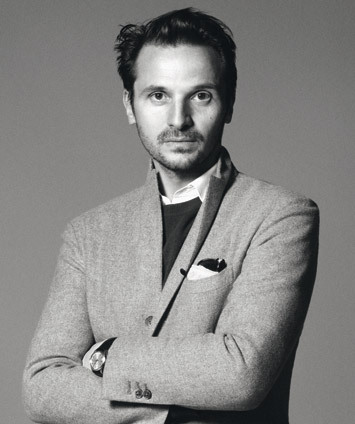 Franck Durand (born 1969) is the founder and Creative Director of Atelier Franck Durand. At the age of 20 he started working for Marc Ascoli, one of the most influential Art Directors of his generation and at 29, he went into partnership. Six years later, in 2004, he created the Atelier Franck Durand, responsible for the creative design of fashion campaigns for the likes of Balmain’s and Isabel Marant’s. Ask him about the atelier’s timeless, even a bit old-world looking logo and Franck says he just didn’t want to have a trendy logo, which he would be tempted to change every eight months. Franck Durand lives in Paris with his wife Emmanuelle Alt, editor-in-chief of French Vogue, and their two children. What are your selection criteria when looking for photographers? The feeling is important, as well as the quality of their work and the interest we have for them; it’s all very much about the relationship. How much are photographers involved in the design phase? It depends on the relationship we have with the photographer. Photographers such as Inez and Vinoodh or Karim Sadli are people I feel comfortable enough with to talk about a design phase. Would you say there is a creative design that is typically French? In the end there is, but it isn't just about the nationality. It is more about confrontation and the marriage between an uncompromising and rigorous heritage and contemporary creativity. On a more personal note: What does all your creative work have in common? An image, a video, a magazine… These are all, in some way, statements on life. Plus, at the Atelier there is always the desire to keep a connection to reality, even if it's a fantasy. And how would you describe your dream client? The dream client is someone who has constant drive: for proposition and projection and in the quest for quality. Is there a rule when choosing color or black and white for your imagery? There are no rules. What do you think about provocative fashion advertisements? It depends on what one considers to be provocative. Today, it appears rather more as marketing than true provocation. And as a matter of fact, which campaigns can be seen as provocative today? Hamilton, Bourdin or Newton wouldn't be able to publish the same images today. Seducing the masses means also accepting that you have to be more prudish. What would be your criteria for a unique fashion advertisement? A campaign is a matter of seduction. Therefore, the first step is to look for the embodiment, not to be confused with the target; and to keep it very personal but not to the extent maybe where »they'll get it in 15 years« either. You should also always be in touch with reality. We believe our work to be successful when our involvement becomes invisible. Do you have an all-time favorite advertisement? At the time, the Jil Sander F/W 91/92 by Nick Knight with Linda Evangelista in a pink armchair was a very striking campaign for me. Which movie could you watch every day? There are a few which all have very different styles. At the moment though, as it’s quite cold in Paris, I would like to see a comedy like Richard Quine's »Bell, Book and Candle«. How do you like your apartment: Designer with clean lines or cozy and more cluttered? We live in the 16th arrondissement, in Village Boileau. I have always been rather tidy by nature. Therefore, our house looks like a summerhouse: light, warm and tidy. In which situations do you ask your wife Emmanuelle for creative advice? And when does she ask you? We rarely talk about our work. When we do, it is more about the unusual and funny moments, seldom about the struggles.